Infrared (IR) LED Market size was estimated at over USD 400 million in 2017, growing at a CAGR of over 15% from 2018 to 2024. The global shipments are forecast to reach over 8 billion units by 2024. The growing shift of the optoelectronics industry toward LEDs, such as UV and infrared LEDs is one of the major factors augmenting the growth of the IR LED market at an exponential rate. The extensive demand for these components in the iris and facial recognition of biometric systems and surveillance has been the major force for this pragmatic change. The huge adoption of CCTV cameras globally for public safety and security is one of the major drivers of the Infrared LED market growth. These components are integrated to impart night vision capabilities to the camera. The demand for these cameras in the U.S. is contributing substantially to the North America IR LED market. The introduction of facial recognition and iris recognition systems in mobile devices has flourished the demand for infrared LED market in the consumer electronics sector. Moreover, the penetration of the technology in automotive driver assistance systems is further IR LED propelling the industry growth. Many companies are expanding their production capacities to meet the growing demands from the automotive & consumer electronics industry. Foreseeing the potential market for these components in the consumer electronics, such as the AR/VR headsets, many companies are focusing on the infrared LED market. Arima Optoelectronics, a Taiwanese manufacturer, entered the industry by exiting from the blue LED market in 2016 to develop these components in the 940nm, 850 nm, and 810 nm wavelengths. Similarly, Opto Tech shifted its focus to develop these components for the automotive and medical industries with the share accounting for 60 percent of its LED products in 2018. The 700nm-850nm spectral range is projected to be the fastest-growing segment with a CAGR of over 17% in the IR LED market. 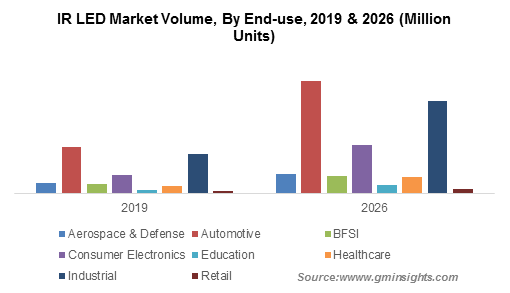 The high growth is attributed to the increasing demand from the consumer electronics sector for facial and iris recognition, in devices such as AR/VR, mobile devices, etc. The extensive elevation toward mobile payment services is one of the major factors driving the demand for iris and facial recognition systems. These systems use 810nm infrared components due to which its demand has increased IR LED. In 2016, Samsung introduced iris recognition in its Galaxy Note 7 Android phone to enhance the user security. This technology is being adopted by many other mobile manufacturers in the industry to incorporate added functionality into their products to gain a competitive edge in the infrared LED market. The surveillance application is anticipated to grow at a CAGR of around 16% in the IR LED market. These components have a huge demand in the military & defense industry in night-vision cameras while carrying out covert operations at night. The components are incorporated into the camera lens around the outer edges. There are several types of infrared cameras available along with specialty cameras such as those capable of license plate recognition. Additionally, the increasing demand for CCTV cameras in the economies including India and China is contributing to the IR LED market growth. This is accredited to the growing investments in infrastructure by the government for ensuring the safety and security of the public. In addition, the growing penetration of the technology in the industrial sector has further pushed the industry demand. These cameras are widely being owned by security-conscious individuals, commercial establishments, and government organizations to inhibit unauthorized entry and access. The automotive industry dominated the industry with nearly 30% of the in the IR LED market in 2017. The evolution of infrared technology for increasing applications in automobiles is emphasizing the manufacturers to shift their focus on these components designed particularly for such applications. In April 2018, Osram introduced a 940nm IR LED to be used as a biometric tool to enable facial recognition. EVERLIGHT has planned to increase its revenue from automotive lighting and invisible LEDs including IR and UV by expanding the manufacturing capacity in the second half of 2018. The healthcare sector will grow at a modest CAGR of around 14% during the forecast period. IR LED bars are used in dermatology and neurology devices. The technology has been promising as a light source for these applications, which is augmenting the IR LED market in the healthcare sector for therapy and treatment. Larson Electronics offers medical infrared light bars that operate in 850nm or 940nm wavelengths. Asia Pacific IR LED market dominated the industry in 2017 with a revenue share of over 35% owing to the strong presence of the optoelectronics manufacturers in the region. The key players in the market are Taiwanese, Epistar, Lextar, and Optotech. These companies are contributing significantly to the industry in the region. IR LEDIn addition, owing to the increasing investments by the governments, the upgrading of the infrastructure in Asia Pacific is propelling the IR LED industry growth. There is an ever-growing demand for CCTV cameras in the countries for security applications. IR LED. Germany is one of the major countries for IR LED market due to the demand from the huge automotive industry base. The demand for the technology is anticipated to grow at CAGR of 17 percent in the German sector owing to the increasing applications in interior and exterior lighting. IR LED. The global IR LED market is highly fragmented with several optoelectronic companies. The major players in the industry include Epistar, EVERLIGHT, Vishay Intertechnology, Inc., Raytek Corporation, Lite-On Technology, and Osram. The companies in Taiwan and China are highly active in the industry and are launching new innovative products. The support provided to Chinese manufacturers by the government has made China have a stronghold over the industry. 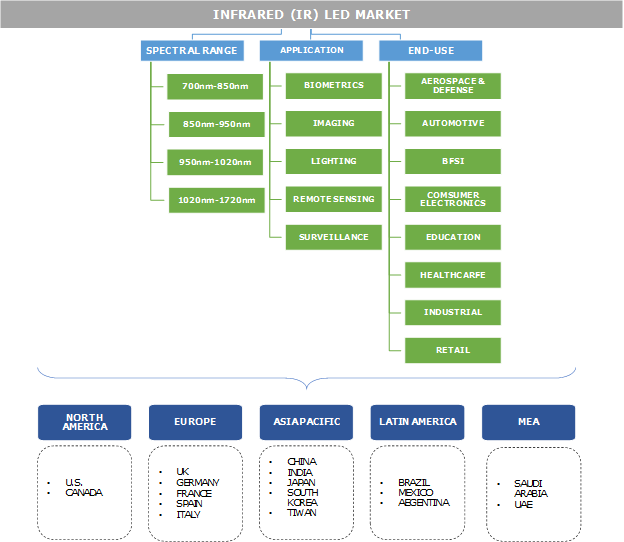 The intense price wars among the manufacturers in LED chips have led the companies to switch to IR LED components for widening their profit margins thereby driving the infrared LED market. These players are following several strategies for gaining a significant share and benefiting from the changing market scenarios. The companies are expanding the production of these components to cater to the increasing demands of the industry. In addition, they are launching several new products in the industry, particularly for automotive and biometric applications. For instance, EVERLIGHT Electronics introduced 810nm IR LED for iris-based biometric systems. This component is compatible with security systems and portable handsets. The IR LED market is projected to witness significant growth over the forecast period owing to the increasing application of these components across various industry verticals. Primarily, industry is predominant in the surveillance sector as these components are used in cameras for night vision feature. The other major end-use segment for the technology is the healthcare and the automotive sectors. With the penetration of these components in the consumer electronics segment, companies are focusing their efforts IR LED to manufacture components for iris recognition systems. Many companies have launched their products for this application, augmenting the industry demand. The companies are investing heavily on the industry to maintain their position in the industry.